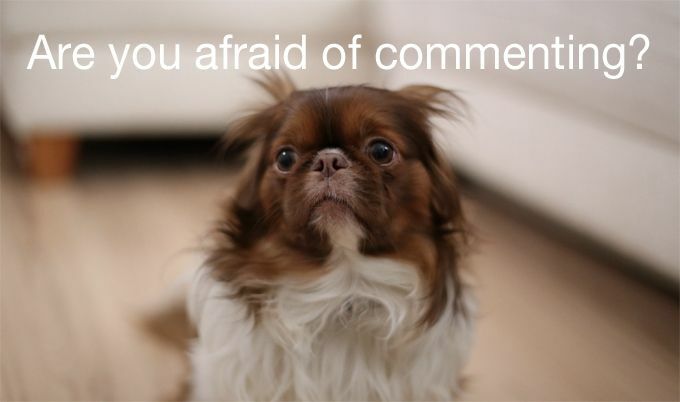 Are you afraid of commenting? Not everyone finds the process of commenting an easy thing to do. Apart from the writing bit, a lot of the trouble is girding your loins to actually do the deed. Or finding time to make an effort. Even being inspired to do so. There will always be some people who are apprehensive about commenting on posts. However, let me assure you there is not need to be afraid of commenting. It is something you can overcome quite easily. Seeing that empty commenting area below a post can be quite daunting. A virgin space nobody has yet dared to make an imprint on can easily make a new reader afraid of commenting. You could see it as carte blanche to have your say. No other reader has superseded you by stating the obvious or even writing what you were going to say. You have a totally free rein to get your point of view across before anyone else. Breaking the commenting duck is a worthwhile act to get the top position. Here you are more likely to be noticed, and your comment could even influence any that are written afterwards. Those with a lack of self esteem may worry about what other readers think about their comments. They take no comfort in imagining how others will react. They perceive the worst and feel nobody will be interested in their opinion. You need to remember that you know stuff that other people don't. What pearls of wisdom can you relate that are relevant to the post? What special gift do you have that you can share to make the other readers' lives better? It is highly unlikely you will upset anyone with your point of view, especially if you are really careful in how you write it. You won't be blurting anything out regardless to cause offence, because you will have thought about it thoroughly beforehand. A continuation on the lack of esteem subject is fretting about your comment's quality. You may be consumed with self-doubt about the way you responded. You may have read all the other comments and assumed they were better than yours. There is no need to be intimidated by the other commenters. The fact that you have bothered to comment at all puts you on a higher pedestal than those readers who haven't. Your are entitled to have your say and you should do so proudly. There's no need to be afraid of commenting here. Remember all commenters are individual in their writing style. Basically any comment that doesn't meet the mark (eg it isn't spam) has to be pretty bad to not get published. And the post's author will be grateful to receive any comments that are submitted, so will be publishing them all. If you are scared others will disagree with your comment, take a deep breath and submit it anyway. Provided you have carefully weighed your argument, and have considered the pros and cons, there is no reason why you should be afraid of commenting to put your point of view across. Expressing disagreement is good for commenting. It shows a variety of readership that makes the replies more interesting. And if your opposition sparks responses from others, this will result in a lively discussion, which is good for all concerned. Whatever side you take in an argument, stick to your guns (unless you see the other point of view anyway). You won't look stupid or inadequate in front of the other readers if you are sure of your convictions. Writers block happens not only to those who write the posts, but to the commenters as well. You may have been inspired by the quality of the content, but when it comes to writing your own response, everything dries up. It could be apprehension you don't have enough expertise to provide an answer, or you feel not worthy to continue the conversation. It could also be due to insufficient time to write a reasonable comment, and the stress hinders your creative juices at that moment in time. Commenting shouldn't be a quick affair, even if you are stimulated at the spur of the moment to have your say. Time is needed to compose a reasonable response, something you would be proud to read back again once it has been accepted and published. If you are not used to commenting, and haven't had enough time to get experienced at it, taking advantage of this opportunity could make you afraid of commenting. The answer is not to crave total approval from all the readers. The only person who want to impress is the post's author, as it is they who will be accepting and publishing your comment. There is no need to fear being judged by others. It doesn't really matter what they think. What is important is that you have spread some love by commenting and made the post's author a much happier person by your actions. Has being afraid of commenting ever affected you? Let me know in the commenting box below whether you have been afraid of commenting, or whether you are now. If you are, would you benefit from some encouragement? The Commenting Club has been created to help anyone who wants to become an expert commenter. You will receive tips and techniques to make the commenting process easier, and a thorough understanding of how important commenting is. And our community is also there to help you to become less afraid of commenting. Why not give us a try?